Home > Blog > Can Shrink Wrap Provide Noise Reduction On Construction Sites? 19 Apr Can Shrink Wrap Provide Noise Reduction On Construction Sites? This week I was contacted by a scaffolding company looking for a shrink wrap scaffold sheeting that will reduce building work noise escaping from a construction site and disturbing people working nearby. Their customer is a TV studio and they do not want any noise from building work taking place on site affecting the operations of the studio. The scaffolders asked me if Rhino could supply a noise reducing shrink wrap. Requests for noise reducing shrink wrap are fairly frequent, and certainly Monarflex have sold a noise reducing scaffold sheeting for some years now. However, there seems to be some confusion surrounding noise reducing or ‘acoustic insulating’ scaffold sheeting, probably caused by hard to understand terminology and the way that the test results from noise reducing products are presented. So, can shrink wrap provide noise reduction? Well…yes it can but it is not the only option and this short guide outlines the other sound absorbing products we supply (and install) to reduce the impact of construct site noise. Any type of sheeting hung around the scaffolding will reduce noise ‘breakout’ on construction sites. For most jobs a 7m wide x 15m long, 300 micron thick shrink wrap will provide a sound reduction of 5 Decibels (dB). However, where noise reduction is of particular concern, our 500 micron ‘noise reduction’ sheeting will achieve an 8dB reduction. 500 micron sheeting is supplied as a 3m wide x 20m long roll which weighs 516g / m2 or 31 Kg a roll. Another option for scaffolders and contractors is the acoustic insulating or ‘sound absorbing’ panel. These flexible panels are typically manufactured from a heavy duty flame retardant PVC and generally offer the highest level of noise reduction performance. In addition they are designed to be re-used multiple times and can be supplied in a wide variety of colours, that can even be custom branded with a contractors logo etc. Panel systems are generally multi purpose, i.e can be attached to ‘Heras’ fencing panels and/or scaffolding. Scaffold system manufacturers have developed their own noise reduction products – as Layher’s. However a number of generic systems have been developed. One such system is Silensite’s Acoustic Barrier. Like Monarflex’s Monarsound this product is cable tied or bungeed to the scaffolding lift by lift, with each panel overlapping to prevent any holes or gaps which will let noise escape. Silentsite Acoustic Barrier is supplied as a 2m high x 1.2m wide panel. Tested to BS-5228-2:2009 and EN ISO 11654:1997 they are specified to reduce construction site noise by up to 32 Decibels (dB). Typical costs – Unlike shrink wrap or Monarflex, these products can either be purchased outright or rented. From £55/m2 for outright purchase. Advantages: Highest levels of performance, re-usable, custom branding, van be purchased outright or hired. Disadvantages: Not suitable for scaffolds with many protrusions. In summary, construction sites can generate high levels of noise that can disturb nearby residents and businesses. Reducing the noise ‘at source’ is the best option and local authorities will usually impose restrictions on noisy work outside of certain hours. However, additional noise reduction may be required and can even form part of the planning permission in some areas. 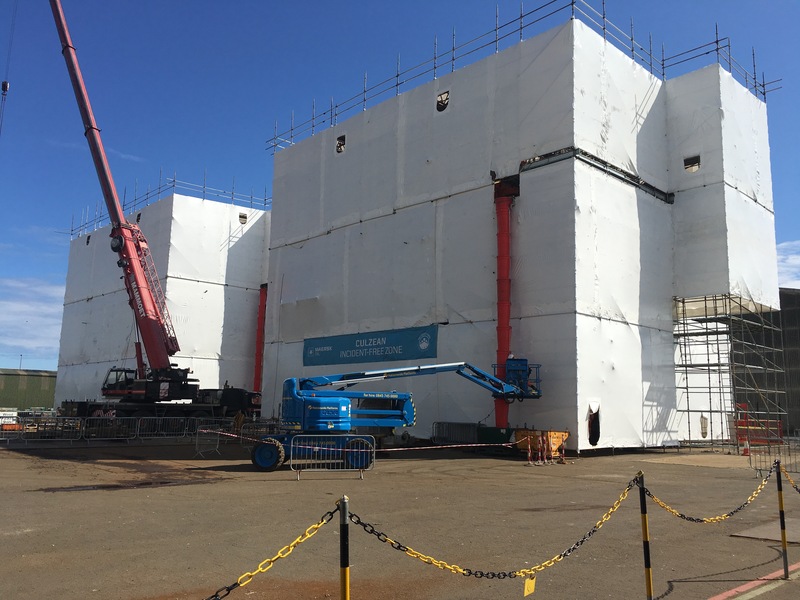 Shrink wrap sheeting can provide some noise reduction but Rhino supply (and install if necessary) a range of options to suit the application and budget. If you have an issue with ‘construction noise’ call our friendly team on 01477 532222 and we will be pleased to help.